President Trump’s company plans to institute E-Verify, a federal program that allows employers to check whether new hires are legally eligible to work in the United States, in every one of its golf clubs, hotels and resorts, following a Washington Post report that its club in Westchester County, N.Y., employed undocumented immigrants for years. 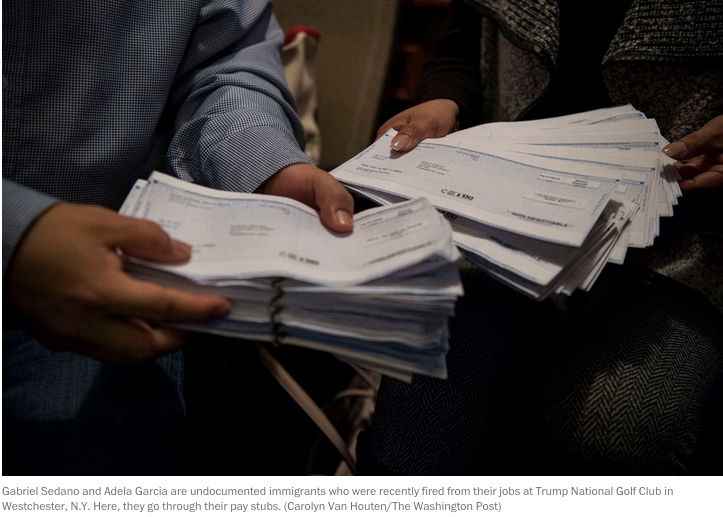 The move is the first acknowledgment by the president’s private business that it has failed to fully check the work status of all its employees, despite Trump’s claims during the 2016 campaign that he used E-Verify across his properties. At the time, he called for the program to be mandatory for all employers. The decision by the Trump Organization is not likely to head off calls for an investigation by congressional Democrats, who on Tuesday began gathering signatures for a letter to FBI Director Christopher A. Wray seeking a probe into whether the president’s company broke the law by hiring undocumented workers. The company’s new embrace of E-Verify highlights the sharp disconnect between Trump’s hard-line rhetoric on undocumented immigrants — including his dark warnings that they threaten the country’s safety and steal American jobs — and what appears to have been a lax approach by his own business to checking the legal status of its workers. The Post reported Saturday that about a dozen undocumented workers from Latin America employed by the Trump National Golf Club in Westchester County — roughly half its wintertime staff — were fired amid new scrutiny of its hiring practices. Next Post A Big Trump Case Hinges On the Definition Of ‘Emoluments.’ A New Study Has Bad News For Him.